Where does this start, the story of my ’71 B? It started as a dream in 1970 in Pascagoula, Mississippi. We had moved there for my job in the Navy, on a submarine being built in the shipyard. My wife got a job for a year in the school system, the first year the schools were integrated there. We held off buying a second car because we were moving to Hawaii. We planned to buy a sports car with her entire year’s earning, all $3000, and it was going to be ‘Nancy’s car’. We got to Hawaii finally, in 1971, all ready to buy our, err, “her” car. To be truthful, we had our hearts set on a Triumph Spitfire. But there was a problem when we went to the dealer): there was a shipping strike which meant only essential items were being shipped in (sports cars aren’t essential?). 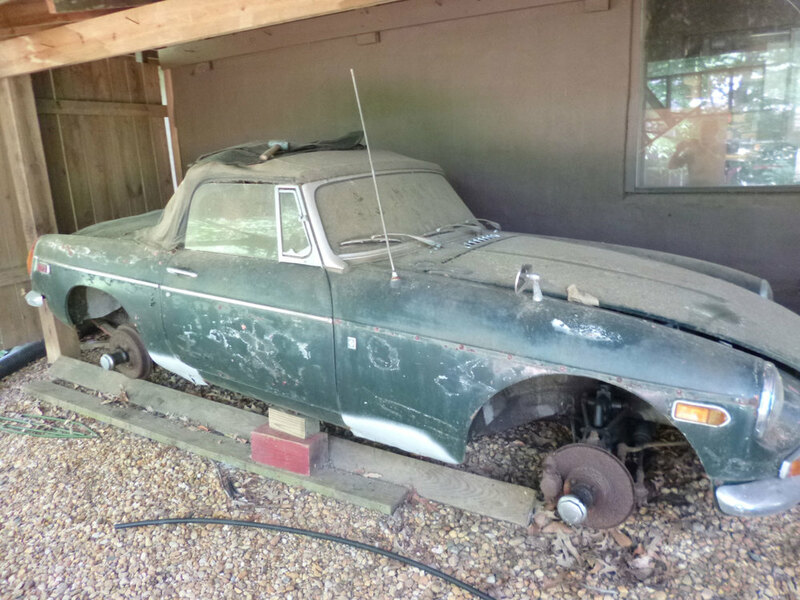 So we asked, ‘what do you have?’ They had a ’71 MGB in ‘new racing green’ autumn leaf interior, wire wheels, radio, no heater or defroster (more to come). We fell in love with the MGB, bought it and drove all over the island, up mountain passes, into downtown Honolulu, to beaches on the weekends, parties, absolutely everywhere. The B turned heads including University of Hawaii students where Nancy was a grad student in library studies (a librarian in a MGB??). It even fit Nancy when she was nine months pregnant with our first child, getting a speeding ticket on Ala Moana Blvd... And it also fit the basinet in the back with our infant daughter (no child seat rules back then!). I also learned how to fix everything on the car because, on my salary, we couldn’t afford taking it to the dealer. And who needed the top up? It was either in the carport with the tonneau cover on it, or cruising over 35 MPH as the rain went straight over the windshield and you stayed dry. All good things have to end, and our time in Hawaiian paradise had to end. I was getting transferred to Connecticut (ice and snow). So as I mentioned previously, the car came with no heater or defroster, so I knew it would be a problem. (I know, a B doesn’t put out much heat, but no heat?). So after searching the junk yards of Oahu (not many Bs there), I found a ’69 B that was pretty much gone, but still had the heater, blower, defroster and pipes. Ever replace a heater and defroster in a B? I am surprised I have any skin left on my hands, but the heat worked (at least in Hawaii). We drove down to the port of Bayonne, NJ and picked it up, almost burned up the right rear brake drum with a frozen set of shoes, and learned that although the heat worked in Hawaii in 85 degree weather, in 15 degree weather it was hard to tell. So we learned to live with a B in the winter. I even bought a sixth wheel rim, wire spokes of course, put snow tires on two of the six rims, and learned to drive a B in heavy snow. After 7 years of sea duty, I finally got some duty ashore, and we moved to Fairfax, VA. The B moved too, got new floor pans sort of held in by my clumsy welding, and a new clutch by rigging out the motor and transmission in my carport in the middle of the winter (another task that can be done better with the right equipment and inside. Our move to Virginia Beach was at the B’s 10 year mark and it started the slow, downhill struggle to stay the #1 car in our hearts and mind. I think my multiple six-month deployments out to sea on two different subs, and the fact that we all could no longer fit in the car as a family started to spell the story. As soon as I left for a long deployment, my wife would drive the car down to the long term storage lot. It still had a few good times also. When I sponsored several midshipmen (Navy students) for their summer training, I would get the B out of storage, tune it up and turn it over to the Mids. Summer isn’t fun when you’re a young guy far away from home, so three guys sharing a set of ‘wheels’, and an MGB at that, was pretty special!. After 8 years of sea duty, we moved back to Fairfax, VA I am not sure how the clutch survived as both of our daughters learned to drive a manual car on the MGB before they got their driver’s licenses. By this time our car collection had grown. In addition to the B, we had 4 other cars. Things started to get crowded when I added a Porsche 356A project car., So in my enthusiasm for restoration, I figured I would do the 356A next, and secondly get the B back to it old glory. So I built a roof under my back deck, and in 1990 drove the B under the deck where it still sits now, in still-temporary retirement. What’s next? I never finished the 356A, so it’s going to be sold and moved out of the shop behind the garage. Then the B gets to be #1 priority although the engine only has 104,000 miles, it will get overhauled, all the major parts overhauled or replaced new everything in carpeting, panels, seats etc, and repainted the original new racing green. It doesn’t make economic sense restoring the B, (restoring the Porsche would actually be profitable), but when it comes to the B, all the great memories mean a lot more than money. And if I can convince my wife to drive in a car without airbags, she will enjoy it again with that hard earned money she made 44 years ago in Pascagoula, Mississippi.